5 Easy Mesa Car Repairs to Do Yourself and Save Money! Here are 5 easy car repairs you can do yourself! Let’s face it, car repairs can be expensive and there is never a right time for them to creep up on you. With the holidays around the corner, you are probably even more on a budget than usually. Hopefully, your car will carry you smoothly through the holiday season, but just in case something goes wrong, we have compiled a list of car repairs to try yourself. Okay, this one might be lacking the glamour and elbow grease of the mental car repair picture, you probably have, but if it is broken and needs fixing, it totally counts as DIY car repair. Resist the urge to rip the blade of the wiper, which will only cause the connecting link to bend or break. If you are a daredevil, toss the instructions and wing the replacement. Another easy DIY repair for beginners. Probably the biggest obstacle you will be facing is to find the location of the filter, which is generally close to the engine. Lift it out (or unscrew it, if applicable) and replace the old worn-out filter with a new one, which will boost your car’s performance and save you a bundle to boot. classic DIY car repair job for the aspiring home mechanic. It will get you greasy and satisfactory dirty and save you a few bucks on top of it. Many car owners leave this one up to their auto mechanic, because it is a truly messy endeavor and if you are not careful you will end up training the transmission fluid instead of the oil. Bonus tip: wait for a few hours after driving the car to do the oil change, otherwise the oil will be too hot and you can burn yourself. Or take your car to your Mesa car repair shop. Replacing your battery is another fairly simple repair. All you have to do is remove the two connectors, remove battery and put the new one in. For your safety you should wear appropriate gloves and eye protection in case the battery acid spills. Here in Arizona, we see our share of shredded and flat tires on a daily basis and knowing how to change your tires is a real asset. Ideally, you will have everything you need already inside your car such as the spare, the tire iron and the jack, unless you already used your spare, in which case, you want to call your auto mechanic or AAA. This task requires some elbow grease for jacking up the car and loosening the lug nuts, but it gives you a true bad a** feeling when you are done. Truly a must for everyone to try out at least once. While there are many more repairs you can do on your own (depending on your skill set) these are a good place to get started. More advanced home mechanics can change brake pads and discs, stripped screws, blown fuses and more. If you are uncertain about a particular car repair contact your Mesa auto mechanic for help. 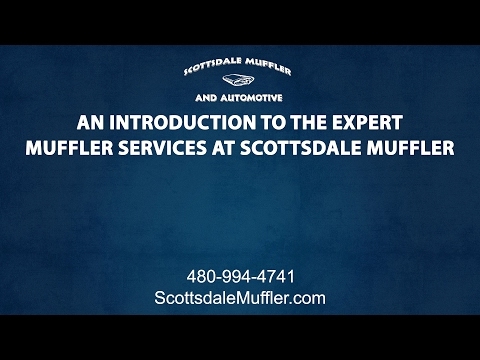 Here at Scottsdale Muffler and Automotive, we have been helping drivers and their cars for many years. To schedule an appointment and to learn more about our services and car repairs, contact us today.